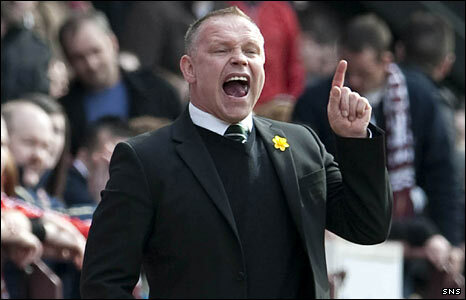 Hibernian manager John Hughes felt his side gave themselves too much to recover from in the 2-1 loss to Hearts. The visitors found themselves two goals down at the break and Hughes was unhappy with how they had defended. "We had to score three goals in the second half to win the football match, that's too much of an uphill task. "I felt we were on top when they scored their first goal and the way it came about, it's really disappointing. The second one was a poor goal to concede." Hibs have slipped from third to fifth in the Scottish Premier League with the Easter Road struggling to recapture their early-season form. And Hughes admits they need to improve defensively to turn results around. "I need a wee bit more organisation in there," said Hughes. "That comes with experience, guys that are in who are going to bully people and organise. We're a little bit away from that right at this moment in time." Hughes now turns his attention to Tuesday's Scottish Cup replay against Ross County at Victoria Park, with European qualification from a league place still achievable for the Leith side. "I don't know how this season's going to pan out, but right at this moment in time, it's a massive disappointment for us coming here, derby game and getting turned over," added Hughes. "But a lot of teams in Scotland would give their right arm for the position Hibs are in right now. "I can't keep changing diapers all the time, the onus is on them. You're looking for strong characters to stand up and say, 'let's get this show on the road'. "The great thing about football is that we've got the opportunity to do it on Tuesday in the quarter-final of the Scottish Cup. If that doesn't motivate you, nothing will."